Happy Valentine's Day! My children are beyond excited to have a party at school and to pass out their Valentine's Day cards to their friends. 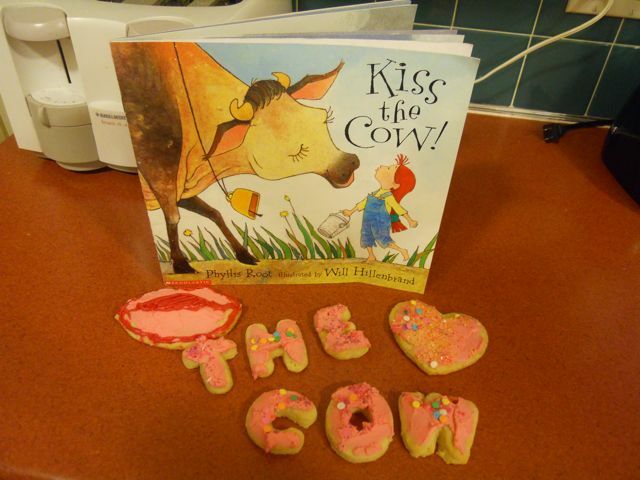 We added a some extra fun to Valentine's Day this year by celebrating Phyllis Root's birthday with many great books and some creative cookie baking. Phyllis Root is the author of over thirty books for children including many board books, picture books, and lift-the-flap books. According to an interview with Seven Impossible Things her career began when she took a class from author, Marion Dane Bauer. She said, "I discovered I could learn to do what I yearned for years to do -- write for children." I found Root's books to be perfect read-alouds -- rhythmic, with lots of onamonapia and rich vocabulary. In her bio on the Candlewick Press website she says, "Picture books are performances. They're performances that involve a child -- something both of you do. And once I started thinking of them that way, I started getting much looser about making up words and playing around with rhythm." I could have chosen so many books to focus on for a birthday activity -- Ten Sleepy Sheep, Oliver Finds His Way, or Rattletrap Car, but I decided to focus on one that has a personal meaning to our family. 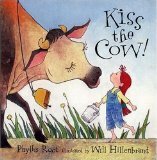 This week, our favorite book we read by Phyllis Root was Kiss the Cow. The book reminded us a lot of Strega Nona by Tomie dePaola. In that book, Big Anthony does not follow the rules of the magic pasta pot and noodles flood the whole town. In Kiss the Cow, a large family depends on milk from a magic cow named Luella. A stubborn and curious member of the family named Annalisa ignores her mother's request to leave the cow alone. Annalisa's curiosity taught her the magic words to say and she was certain that she could milk the cow on her own. However, she neglects the important kiss on the cow's nose after her pail is full. This makes the cow sad and no longer provides milk for the family. Annalisa's stubbornness causes the family to be without milk and cheese for some time. 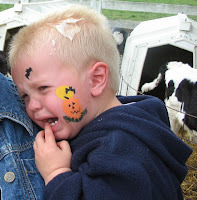 Her mother and siblings urge her to kiss the cow, but only Annalisa can solve this problem. head right after enjoying a bottle of milk! Sift together: 3 c. flour, 1 tsp. baking powder, 1 tsp. salt, 1 tsp. baking soda, 1 cup of sugar. Add 1 cup butter and crumb like pie dough. Add 2 eggs, 4 T. and 2 tsp. milk, and 2 tsp. vanilla. Combine well. 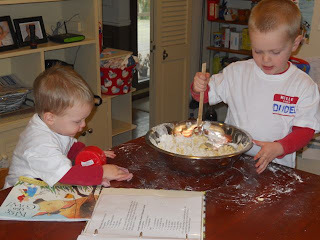 Roll dough and cut out cookies. Bake at 350 degrees for 10 minutes. 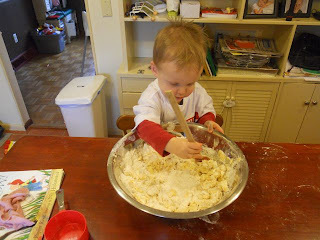 The little man works the cookie dough. After the dough was combined we chilled it in the refrigerator for about an hour. Meanwhile, we wanted to have "KISS" cookies, but our collection of Valentine's Day cookie cutters was comprised of only hearts. 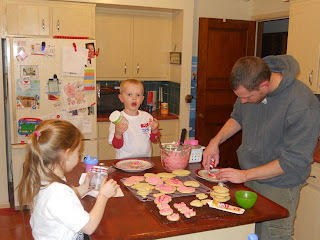 So, I googled "homemade cookie cutters" and I found directions on a website, Cut Out! 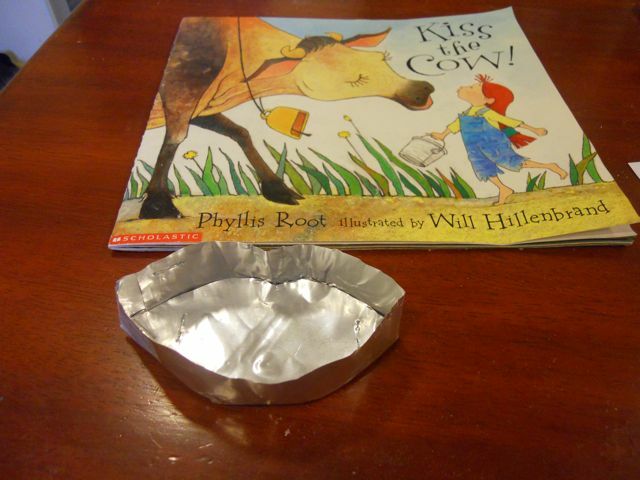 and Keep, to make a cookie cutter out of a tin turkey pan. I followed the directions exactly and was successful in making a "KISS" cookie cutter. My daughter was pleased to participate in the decorating of the cookies after she came home from school. Thank you to a long time reader of the blog and a family friend for recommending that I celebrate Phyllis Root's birthday with my family! Eric, I’d like to recommend you for the Liebster Blog Award. I just have to check to be sure that you have less than 200 followers and that you would like to be nominated. I have more than 200 Followers. But, Thanks for thinking of me!